How to Schedule an Apex Class to run every 30 minutes? You get this exception message on a simple aggregate query like this. You try to use a limit clause but the query still fails. Even though you may use a limit clause, aggregate queries will have to touch all records in the database. If you have less than 50000 Cases you would not receive this error message. Try to limit query results using a WHERE clause. If using this on a visualforce page and you do not perform any DML (insert, update etc) from the page, set readOnly=true on the apex:page tag. Make sure the following box is checked for the user who runs the flow. This box is unchecked by default. Error: common.exception. SqlDupValOnIndexException: ORA-00001: unique constraint (CORE.AK2APEX_CLASS) violated ORA-06512: at "DOC.CAPEX"
Solution: You probably have an Apex Class with the same name already. Check the name of your apex class and modify accordingly. Apex Count the number of occurences of a character(substring) in a string? I created a Salesforce Community, tried to edit the community using Site.com Studio and could not find a way to add DATA and form elements. This is how my editor looked like. 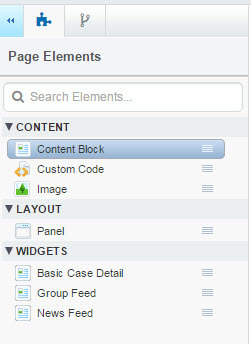 Change the template to 'Salesforce TABS + Visualforce' and the DATA and FORM elements will be available. The DATA and FORM elements are not available/visible with the Kokua, Koa, Napili and Aloha templates. If you have already created pages with any of these templates, you will have to delete ALL pages and then change the template to 'Salesforce TABS + Visualforce'. Any new page you create after this will have the DATA and FORM page elements. Use the following piece of code to submit approval requests in BULK. This code can be anonymously executed from the developer console.